Writer Magdalene Visaggio, artist Sonny Liew, and colorist Chris Chuckry turn the story of Caroline Sharp on it’s head with issue four. Sharp is the former superhero known as Chrysalis, who was gifted with incredible powers while being horribly disfigured in a mission gone wrong for the secret organization Alpha 13. The creative team have been slowly building on Caroline’s downward spiral into depression. She wants nothing more than to end her life, but her immortality is standing in the way. Her goal may be achievable; however, she might end all of life for all of eternity, which, unfortunately, Caroline doesn’t seem to think matters anymore. The last issue ended with an cliffhanger that could have honestly ended the series. Caroline had finally learned to control every atom in her body in hopes of finally ending her life by achieving fission. However, this is not to be thanks to Rick Rex, alias The Never Man. Rick was introduced in the backstory that was included with Milk Wars. Very little is known about Rick or his powers, other than that he is a former co-worker of Caroline. Writer Magdalene Visaggio delves deep into the history of Caroline and her nemesis, Madame Atom, with this incredible issue that combines the efforts of creative team into something special. 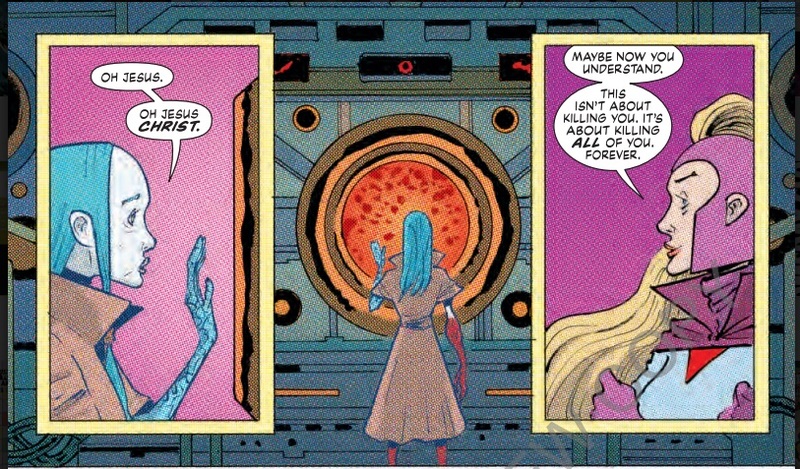 In the last issue, Caroline has realized that she is stuck in an endless cycle of life and death over an infinite number of lives, which is a huge theme in this issue. Visaggio has written a slightly different version of Caroline across 5 different storylines. Each story is focused on a conflict between Caroline and Madame Atom, with one or both dying at the end. Madame Atom casually dropped the line that she had killed Caroline before in issue three, now it is revealed. Magdalene still keeps the serious tone of the story but introduces all of these slightly different versions, some serious, some quirky, but all with the same outcome: death. This new revelation is a big development for Caroline’s character; no matter what she does she can’t escape death, in one form or another. Sonny Liew has a field day with this issue, five different storylines with vastly different takes on the characters. Liew is really able to showcase his skills as an artist here. 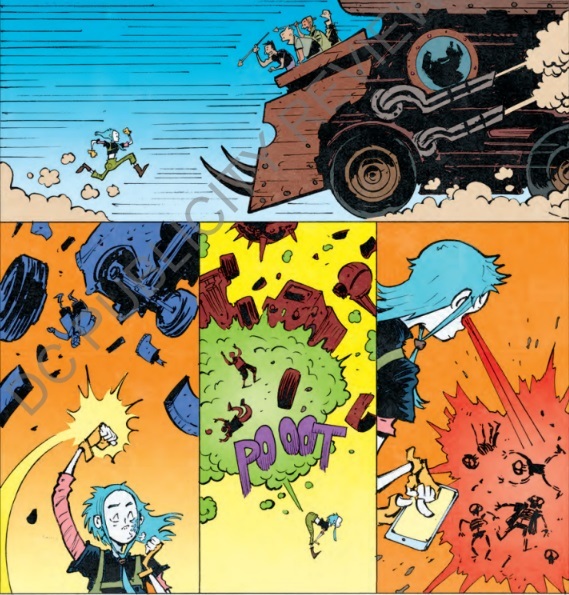 One part gives Caroline a Tank Girl motif, while the other pays homage to classic Peanuts. While his art style may not be everyone’s cup of tea, it fits well into the Young Animal brand and has actually fit this series like a glove. Colorist Chris Chuckry also gets to let loose in this issue. With all of these different storylines he is able to add colorful variations to each new story that give them a distinctive style to fit the artwork. In previous issues, Chuckry’s color use on the panels featuring outer space featured beautiful, vibrant colors. Chuckry is able to transition these vibrant colors to these new storylines and really help them breathe. Another running storyline through this issue is about a record playing. How there are endless grooves in it that spin around and around. This is, of course, referring to Caroline’s immortality. The creative team have really taken this series to new heights with the revelations in this issue. With only two issues left, things are about to get explosive for sure.